Not long after the start of The Monuments Men, George Clooney's elegiac tribute to the dwindling Greatest Generation, it becomes clear why its release date was changed from 2013's exceptionally busy awards season. Spare, subdued and not the least bit flashy, The Monuments Men is a classically structured World War II drama about a group of middle-aged art historians enlisted by Lt. Frank Stokes (Clooney) to reclaim a fortune in looted art from the Nazis. Adding some urgency to the matter at this stage of the war is Hitler's inevitable defeat and his "Nero Decree" calling for the destruction of all of the Reich's property before the Allies acquire it. As critical as this might sound, the crux of The Monuments Men is whether the destruction of some of the world's greatest works of art justifies even one life lost in preventing it. It's a philosophical dilemma that, by its very nature, makes Clooney's film a contemplative exercise more than a thrilling dramatic one. 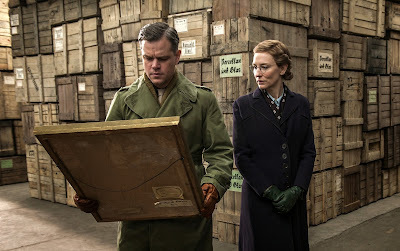 Still, The Monuments Men is a WWII movie, one with higher stakes than immediately apparent, and one that conforms to many of the classic genre conventions one associates with such films. For once, we have an entirely believable motivation for uniting a multicultural group of soldiers that doesn't involve a POW camp or a platoon of crack experts attacking some stronghold. The need for art history experts explains the inclusion of international actors Hugh Bonneville (Downton Abbey) and Jean Dujardin (The Artist) on the team. It also makes it less unlikely that some among their number—Bob Balaban, John Goodman and Bill Murray—would just be starting basic training in their sixties. Much of the film's subtle humor derives from the fact that these scholars are completely out of depth on the battlefield. This fact also demonstrates the bravery of these men and their complete faith in The Monuments Men's central thesis, that the potential destruction of a significant portion of Man's cultural history is a justifiable reason for risking an individual's life. What makes The Monuments Men problematic is the way it delivers that message so impotently. Perhaps it would have simply seemed subversive to have a bunch of professorial types running around occupied Europe in pursuit of history's greatest treasures. Imagine a Raiders of the Lost Ark where the archaeologist isn't some Allan Quatermain-like adventurer, but a real buttoned-up intellectual. The main plot thread of The Monuments Men resembles this understated rethink of a high adventure caper, occasionally expressing itself quite meaningfully. In one scene, Murray's Sgt. Richard Campbell takes a shower at his snowy encampment and tears up when Balaban's Pvt. Preston Savitz plays a recording of Campbell's wife singing "Have Yourself a Merry Little Christmas" over the camp's speaker. But director Clooney lacks confidence in the simplicity of such a statement, inter-cutting the moment with one of a wounded young soldier given morphine and left to die as comfortably as possible when a triage unit can't save him. In overdramatizing Murray's beat, the scene goes from eloquent to schmaltzy fairly quickly. 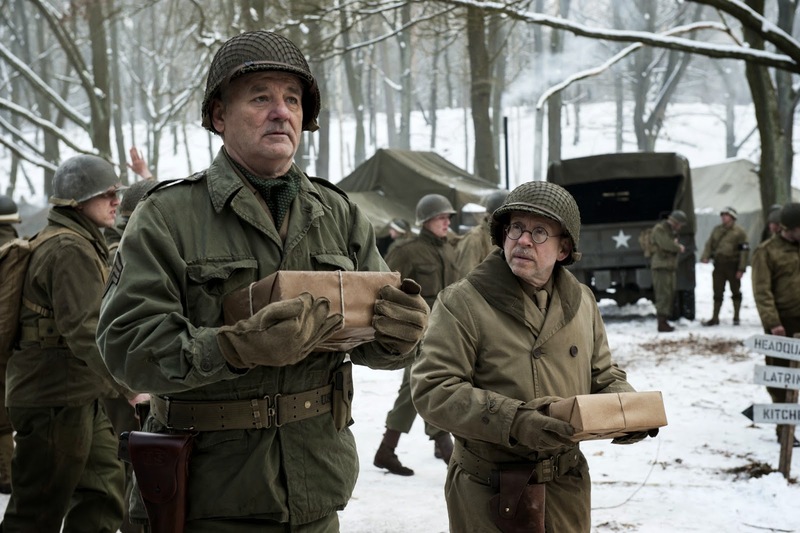 Somewhere in The Monuments Men is an entertaining if only modestly insurgent endeavor. It lacks Clooney's conviction though. Its missteps are concessions to the kind of contrived dramatics that negate the very subversions that would make the film unique. 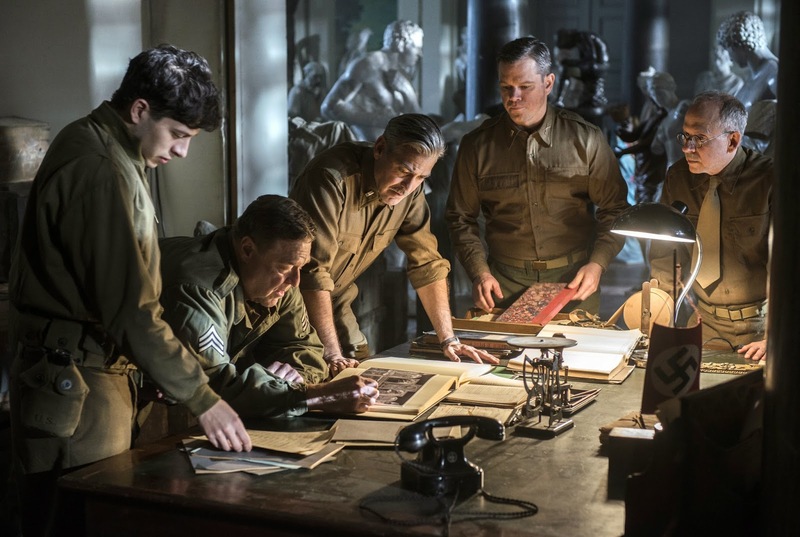 That The Monuments Men is opening in the relatively barren month of February instead of competing among November and December's Oscar hopefuls is a tacit admission of its low ambitions.